Can you fix this GMAT Critical Reasoning discrepancy? The GMAT Critical Reasoning question type “Explain a Discrepancy” has a very specific goal. If you know what your goal is, you’ll be much more likely to answer the question correctly. If you don’t, it can be very easy to get turned around and fall into a trap. Last time, we talked about how to avoid annoying calculations on Data Sufficiency. It’s not so surprising that you can do this on DS, since you don’t “really” have to solve all the way on this question type. I. Roman numeral Quant problems aren’t a whole lot of fun. II. A lot of my students choose to skip them entirely, which is much smarter than wasting five minutes wondering what to do! III. However, it’s possible to turn this rare and tricky problem type into an opportunity. Whenever I see a story problem, I immediately make myself think, “How would I solve this in the real world?” I don’t want to get sucked into doing a bunch of annoying textbook math. In the real world, we lay things out on paper very differently than when we’re in “I’m taking a math test” mode. Type 1: You thought that something was sufficient, but it was actually insufficient. Type 2: You thought that something was insufficient, but it was actually sufficient. 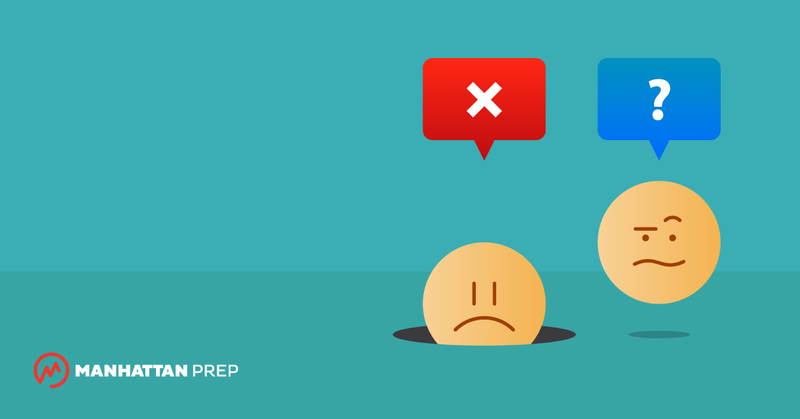 Here’s why you should take the GMAT twice. Over the past five or so years, I have seen more and more students take the GMAT twice.